Kinabalu National Park, about 90 kilometres from Kota Kinabalu, is one of the world's most significant natural environments. The park is home to thousands of types of flora and fauna that are native to the area, and several hundred that are found only in the park. As such, Kinabalu National Park was declared a UNESCO World Heritage site in 2000, the first in Malaysia. While its tourist trails are well-worn, the majority of the park is an unspoilt paradise for rare flora and fauna. For those who aren't keen on testing themselves on Mt Kinabalu's slopes, there is still much to enjoy from a visit to the park. The presence of Mt Kinabalu, the highest mountain in South-East Asia, is one of the contributing factors to the wide variety of animal, bird, insect and plant life found in the park. from Kinabalu National Park.The terrain ranges from lush, green rainforest at the park's lowest altitudes, while further up the mountain, rhodendron and coniferous forest is prevalent. At the highest altitudes, stunted plant growth and small marsupials survive in a harsh environment. Orchids and carnivorous pitcher plants are among the park's most famous plants, although they are rare along the park's most worn tourist trails. However, they are all on display in a botanical walk near park headquarters, where visitors can view some of the area's most beautiful flora. The most famous of the pitcher plants endemic to Kinabalu National Park is Nepenthes raja, a giant pitcher plant whose bell can hold more than three litres of water. There are a number of other species of pitcher plants in the park, and these can be seen just off some of the tracks in the park. pitcher plant in the park.Kinabalu National Park is also home to the world's largest flower, the Rafflesia, which blooms exceptionally rarely and then only for a matter of days. Unlike most of its floral brethren, the Rafflesia emits a foul smell, reminiscent of rotting meat. The stench attracts flies and insects, which the plant then feasts upon. With a diameter of up to one metres and a potential weight of 10 kilograms, the blooming of the Rafflesia is an event keenly awaited by botanists around the world. 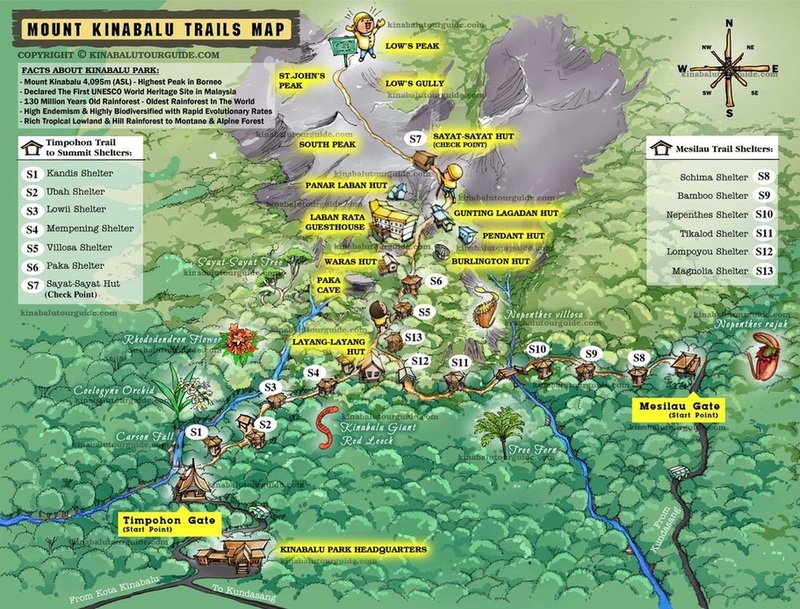 You can read more about Kinabalu National Park at the Sabah Parks website. One of the main attractions of climbing Mt Kinabalu is its accessibility. Prospective climbers don't need any previous experience at high altitude, nor do they require any specialised equipment. However, weather conditions can change rapidly on the mountain. A clear, warm day can suddenly turn into heavy sleeting rain in a matter of minutes. Climbers must be well prepared for any eventuality. All bedding requirements are provided at Laban Rata, so there's no need to take sleeping bags and the like. Meals can be purchased relatively cheaply at Laban Rata, so climbers need only provide snacks and lunch on the first day (if it's not provided by a tour group). As such, the trip can be completed comfortably with a small backpack of about 35-40L. A larger pack will be fine, but keep weight to a minimum. After all, it's hard enough climbing the mountain without lugging any unnecessary weight! A backpack about this size is ideal, but bigger is OK.
Head-mounted torches are highly recommended.All your gear should be packed inside waterproof plastic bags in case of rain on the mountain. The last thing you want when you arrive tired and sweaty at Laban Rata is for all your clean, dry clothes to be soaking wet! Keep in mind that the above list of equipment does not include what you wear on the trail as you set out from park headquarters. What you wear on the trail is really a matter of personal preference. Some climbers prefer to go light and just wear a t-shirt and shorts for the early stages, adding a jumper as they reacher higher altitude. Others prefer to wear pants and a long-sleeved shirt - it's up to you. The climb is strenuous and you will get very warm, simply through your exertions. Layering of clothes is always a good strategy, so you can adjust your clothing depending on the situation. It's a different story for the early morning trek to the summit. It gets very windy and quite cold at Low's Peak, so you'll need to rug up with the gear you've carried up in your backpack. Wear your warm socks, pants, shirt, warm jumper and waterproof jacket when you head off. Gloves and beanie are also essential. Carry a litre of water, snacks and a camera in your jacket, or in a very small day pack. You may get quite warm in the early stages of the climb after Laban Rata, but you'll be glad of the protection as you trek above the tree line. All climbers must purchase a climbing permit from the park headquarters before they depart. This will be checked at both Laban Rata and the Sayat-Sayat hut closer to the summit, so there's no way around it! Permits cost RM100 for non-Malay adults (RM40 for children), while Malay adults pay RM30 (RM12 for their children). The park also requires that all climbing groups hire a guide to accompany you on your trek up the mountain. The actual cost of hiring a guide varies from RM70-100, depending on the size of your group, but a guide can be responsible for eight people at most. Finally, each climber must also pay an insurance fee (RM7) before they embark on the climb. That's the question that every prospective climber needs to ask themselves. There's nothing more disappointing than attempting the climb, only to have to turn back with the peak in sight. As unlikely as it sounds, a few climbers on my trip simply couldn't continue climbing, with less than a kilometre to go to Low's Peak. To avoid disappointment, it's best to know what you're letting yourself in for. As I alluded to on the homepage, there are a number of accounts of the climb that rate it a small step above physical and emotional hell. Likewise, there are others that gloss over the sheer physical effort required to complete the trek. In my experience, neither of these is true. Here it is in plain, simple language: climbing to the summit of Mt Kinabalu is difficult. For most regular tourists, it is likely to be one of the most physically demanding things you will ever attempt. But, it is eminently achievable with preparation and care once you're up on the mountain. As you would expect, the trek is predominantly uphill, except for a brief section just after the starting point at Timpohon Gate. The track alternates between steep stairs and regular sections of uneven inclined track. Without the effects of high altitude, the walk would be physically taxing. With the lack of oxygen, climbers become more fatigued far more quickly. That said, you don't have to be an elite athlete to complete the climb. If you undertake regular exercise - power walking, jogging, social or competitive sport - on a weekly basis, you're more than likely going to be fit enough to reach the summit. On the climb I completed, I was passed on occasions by groups of geriatric Koreans, who put most of the younger climbers to shame! Age is no barrier - fitness is the only determining factor. How fit? Not as fit as this guy. Take it easy at first.Even if you consider yourself pretty fit, every little bit of preparation will help. In the weeks leading up to the climb, go on a couple of walks where sharp inclines make up a large part of the trail. It'll help your muscles become aware of the efforts required. If you're looking to climb Kinabalu, but you're a bit concerned about your ability to do so, don't panic. Three months out from the climb, start going for a brisk walk for 45 minutes, at least twice a week. Just around your local neighbourhood will do for a start. Build up to some incline walks in the last six weeks before you depart and you should be fine. Also, don't attempt the climb with any hint of an injury. Your legs will take enough of a beating ascending and descending the mountain without being compromised by an existing ailment. To give you an idea of the attrition rate, more than 95 per cent of the climbers who attempted the summit on my expedition were successful. They ranged from 15-year-old teenagers to enthusiastic tourists in their 70s, and everything in between. There was a small number of climbers who felt they'd achieved enough by reaching Laban Rata - no small feat in itself! But, a handful of climbers attempted the summit walk and were forced to turn back, either pre-empting their own difficulties or suffering greatly from altitude sickness. A final word of caution on the climb: high altitude can bring even the fittest climber undone. Take it easy from the beginning of the walk. While it might feel easy in the first hour, you'll need those energy reserves later. The same applies for the summit attempt the following morning. Keep it slow and steady and you should be fine. Some people are affected more than others by altitude sickness. It tends to take effect on the Mt Kinabalu climb in the last couple of kilometres to the summit. All climbers will experience an elevated heart rate, even when resting, and a feeling of breathlessness near the summit. For most, a slight headache will be their only other symptom. It's more than manageable with paracetamol and plenty of water. You'll need plenty of rests.However, others can be overcome by nausea. Other than climbing at a slow, steady pace, there is little that can be done to avoid altitude sickness if you're prone to it. The only remedy for altitude sickness is to return to lower altitude - there is no magic pill, unfortunately! Of course, the fitter you are, the more likely you are to be able to cope. Wildlife Mountain Lodge, one of the many guest houses near the park.All climbers must stay overnight at one of the huts at Laban Rata and places are strictly limited. If you're not booking your trip through a tour operator, it's best to get your accommodation at Laban Rata organised before you do anything else, as that will ultimately determine when your climb will take place. No. One of Mt Kinabalu's main attractions is that climbers don't need any special climbing equipment. Good walking shoes, a headtorch and a sturdy windproof jacket are the only essentials. See Equipmentfor more details.